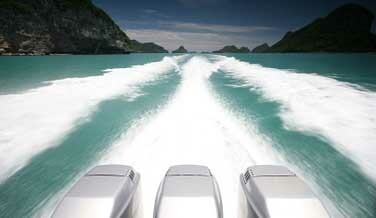 This revolutionary system was developed by our engineers, bought and manufactured by BOMBARDIER and then became a standard equipment of Evinrude outborders (9 different types), Polaris personal water crafts and Kawasaki jet skis. Bombardier holds the patents and trademarks that constitute the Ficht® Fuel Injection Technology. Evinrude is a registered trademark of Bombardier Motor Corporation of America and its subsidiaries. The always highly appreciated characteristics of the 2-stroke engine remain unchanged with FFI. Thanks to FFI, the 2-stroke engine can finally profit from the features the 4-stroke engine has always been famous for.